I've really been enjoying using my new Flexible Cutting Mat and wanted to share with you just why I love it so much. Unlike most cutting boards that are thick and stiff this mat is just the opposite and is thin and flexible. That's a few of reasons I like it so much because once I am done cutting and dicing I can bend the cutting mat and my foods slide right into the bowl. It also means it takes up very little room in my cabinet. It comes with a cute little stand too so you can even stand it up in your cabinet if you like. And the stand doubles as an easy way to air dry it after you wash it. It's recommended that you hand wash the mat with a mild detergent. It's made from antibacterial and food-safe material so it's safe for you to cut foods on. 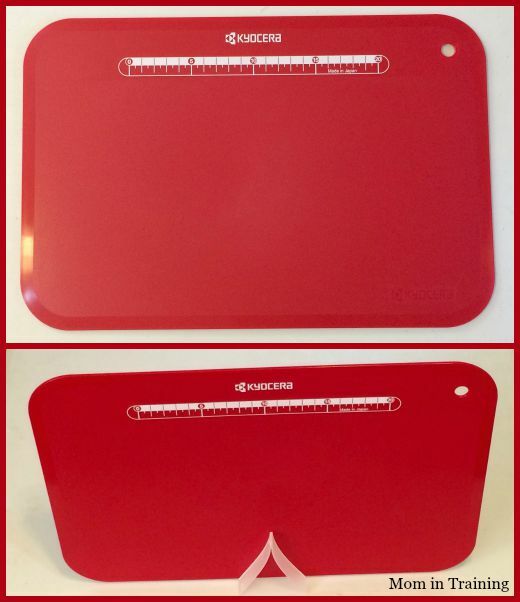 The mat comes in multiple colors so you can dedicate a color to each type of food you'll be cutting on it. I like to use red for beef products and green for veggies. Brighten up your kitchen with this thin, light, bright and flexible cutting mat that comes with a measuring tool for precise cutting. Cleans and stores easily. Comes with a stand for drying or storing. The flexibility makes cut food transfer easy! Mat size measures: 14.5" x 9.8" x 0.1"
Buy it: You can purchase Flexible Cutting Mats online now! That is so cool that they are flexible! I hadn't seen that in a cutting board before. I love how thin this cutting mat is! I'd love to have this in my kitchen!